Erica Bunker | DIY Style! 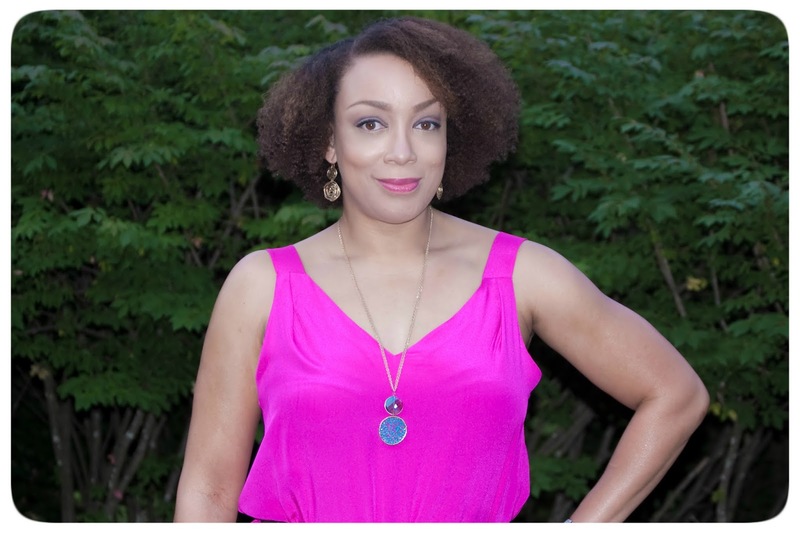 The Art of Cultivating a Stylish Wardrobe: Review: Simplicity 1355 | A Bold Magenta Silk Romper! Review: Simplicity 1355 | A Bold Magenta Silk Romper! Summer is in full-effect here in the South. And cool, casual, chic and comfy looks are required. And one of my favorite summer fabrics is silk crepe de chine. I love it in everything and I can always find a garment that it'll be perfect for. When I saw this beautiful magenta 2-ply silk crepe from Mood Fabrics.com (which unfortunately has sold out. Here is a great alternative, I knew that I would make something fabulous where the fabric could do all of the singing. So I picked this romper. In my area, as soon as the mercury touches 80 degrees, everyone pulls out the shorts! So why not a pair of silk ones?! Because when it boils down, a romper is basically a tank top and shorts. But the best part is that it's one-piece dressing. I love mixing and matching separates like nobody's business, but sometimes I like to grab and go! So for this look, I chose Simplicity 1355. The lines were perfect to showcase such wonderful fabric. And wonderful fabric it is indeed! This silk is the PERFECT weight! And the drape is off the charts! It cut beautifully. I didn't have any problems with "crawling" as some silks and sheers are known to do. And it sewed problem-free also. I used a Microtex needle and made gorgeous French seams. I cut the size medium and added an inch to the bodice to insure a blousing effect. And I added an inch to the crotch and an inch to the hemline. The back was huge and the faux back wrap-style was DEEP! It's summertime and we're already having days that heat up to the low 90s. Adding an additional layer of a tank or cami underneath this is out of the question. And also, I feel that it takes away from the original fabric. So I had to come up with a "seamstress' solution". When dresses plunge to deeply in the front, seamstresses add "modesty panels". So, why not add one to the back? And that's just what I did. This solved the problem of the bodice being "bra-UNfriendly" and also the oversized issue of the straps falling off the shoulder. I basically measured crosswise from where the bra band would go and cut a triangle and sewed it in using a topstitch. Problem solved. This fabric is amazing and the photos just don't even do the color justice! It's one of the most vibrant jewel-tone magentas that I've ever seen. And I've made a mental note to buy extra of a fabulous fabric the first time! The color is radiant and you look Chic and comfy in this romper. Enjoy! Wow, that looks amazing. I've just ordered this pattern as I think a jumpsuit is going to be my party go to outfit for this summer. Love your choice of colour - a pink that makes your soul sing! I'm not really a pink kinda girl, but when I find a fabulous fuchsia or this vibrant magenta, I have to have it! Thanks T! This colour is perfect on you and you look amazing in this new make! Ps - you are my 'fit-spiration'! Love this! I was just on the fence about rather or not I could pull off a shorts-romper (vs pants jumpsuit). I think I'll give it a try! The fabric does look quite scrumptious. Even in photos! Gorgeous! I want to make one!!! oh MAN i wish this stuff was still online. glorious jumper!! I'm mad about that too! I wish I'd bought more! Thanks Oona! GORGEOUS color! Very pretty and Summery. Wow, you look exceptional in this beautiful color, and I really love the way the panel in the back turned out--it looks like a cool, subtle design feature. Really inspiring! I bought this pattern over the weekend and I really want to make the jumpsuit, but I am scared. Every time I sew with a pattern it never comes out right. You did a wonderful job! You have to get over the fear and just keep going. Through mistakes, you'll learn a lot! That's how seasoned seamstresses learned to sew! Thanks Lori! It looks absolutely great on you. At first I thought you had perfectly matched a cami under there, but then I read about the "modesty panel". Genius! Love the color of your jumpsuit, very cute! Gorgeous and you're right, that color is so rich! Great idea adding the modesty panel! This is so cute, and you're right, just perfect for those hotter than hell days when you really don't want to put anything on, but still want to look decent.